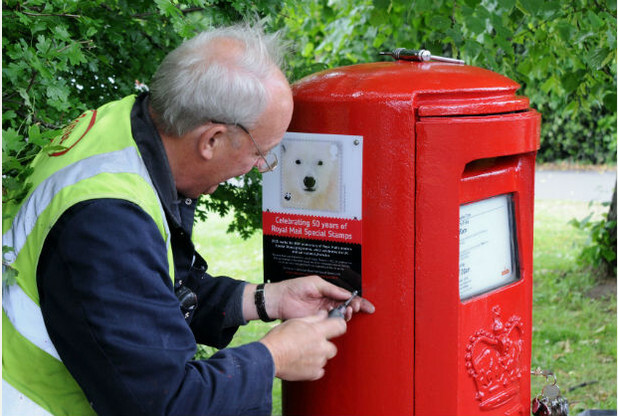 postboxes across the country to mark the 50th anniversary of special stamps. Each of the 50 plaques will feature a stamp connected to the village, town or city, ranging from London and Leeds to Llandudno and Blackpool. Stamps on the postboxes include images of Winston Churchill, Bagpuss, Dylan Thomas, Robert Burns, the Giant’s Causeway, York Minster and Sherlock Holmes. The full list of stamps and locations as provided by Royal Mail. Some of these are not very precise, so we will welcome reports of more precise locations, and identification of which stamp (eg Edinburgh Castle) if you find one. Sad to note the absence of Wales and Northern Ireland from this list when there have been plenty of stamps with identifiable locations in both. And a warning to all bloggers - don't rely on the press release being correct. After I alerted RM through social media to the absence of Llandudno, the site was updated with the missing locations, including Woodstock, and Wales and Northern Ireland. Didn't occur to me to actually count the number of lines in the table! Brian has sent details of another postbox which has a plate on it (see right). This is in London's Fleet Street, near the old Daily Express building. "This plaque commemorates the bicentenary of the birth of Anthony Trollope(1815-1882) who introduced pillar boxes to the United Kingdom in 1852. In 1855 this street became one of the first in London to have a pillar box." Royal Mail are using social media to keep people updated. A lot of links are in the 'comments' below; I don't have time to add all the pictures to the blog at this time, but may do a page later. Thanks to our Anonymous contributors. Is from "London and Leeds to Lladudno and Blackpool" a quote from Royal Mail as, of course, Lladudno IS in Wales so perhaps there are some Welsh sites yet to be announced? Sadly the press release that I saw on their website was incomplete :-( List now updated. At the risk of sounding pompous which I suppose I have a tendency towards, this blog is a wonderful example of why children should be encouraged to collect stamps not just for pleasure but for their education value. Looking at the list of depicted stamps I saw that CS Lewis/Narnia is represented on a Belfast post box. What on earth, I asked myself, had CS Lewis to do with Belfast? I googled and discovered that he was born there and the scenery of Northern Ireland inspired his vision of Narnia. Well, I never knew that - the power of stamps as educational tools even for an old man like me - wonderful aren't they? Even if press releases are sometimes wrong. I looked at this and scratched my head. Can someone explain how the Royal Mail arrive at 50 years? The first Commemoratives were the British Empire Exhibition stamps of 1924, with further infrequent issues in 1925, 1929, 1935, 1937 etc. There appear to be infrequent sets in the late 1950s and early 1960s with 1963 seeing a dramatic increase in issues. That year saw the launch of the First Day of Issue postmark and 1964 saw the introduction of the Presentation Pack but they celebrate 50 years of Special issues just back to 1965? I must admit I have noticed of late that most press releases by Royal Mail (and the Royal Mint) are really just advertising features and often don’t let facts get in the way of a good headline. Is there any valid reason why they have only started counting from 1965, aside from the fact 50th Anniversary reads better than 91st? "2015 marks the 50th anniversary of Royal Mail’s modern Special Stamp programme, which celebrates the UK and our national character. A total of 2,663 Special Stamps have been issued since July 1965." I think they might have added the word 'modern' since they first splashed this microsite earlier in the year and people alerted them to the 1924/25/29/35/37 etc special commemorative stamps. The second paragraph here explains how they arrive at the criteria for Modern commemoratives http://rmspecialstamps.com/##infoModal. I can’t help thinking RM misses an opportunity here, they could have issued a miniature sheet featuring the 1965 Churchill stamps which would have dealt with two anniversaries in one go. 1965 was the point at which Tony Benn, as Postmaster General, laid down criteria for the subject matter of special stamps and that they would be issued on a regular basis (rather than sporadically). I have been. I found it. I was not impressed. Looked very plasticky and also looked out of place on the pillar box (not nicely fixed, bit like an ill-fitting item of clothing - shirt/blouse bulging at the buttons). Oh come on everybody lets get real for once, this is no better than moving the deck chairs on the titanic! What a waste of time money and effort, didn't the Royal mail also come up with the idea that they would put posters of Royal Mail Vans to advertise new issues, and hey presto off the public go to the local post office and find they cant buy commemorative stamps over the counter. Things started to go wrong when the Philatelic Counters were closed down and all the staff with years of philatelic experience were moved to other duties, I don't recall seeing any effort by any collectors to fight the closing down and look where it has got us with 'collectibles' available from the Bureau in Edinburgh and what a lovely book the price lists makes with 86 pages of dross from cufflinks to money boxes and soft toys! a few plastic plaques stuck on the side of some post boxes is not going to make any difference to anything!. Thought this site of be of interest, http://www.postboxfinder.co.uk/. Whilst it doesn’t give details of the post boxes with the panels or the gold post boxes, it does give the location of post boxes in general, so give you a clue as to where to look. Maybe we could get them to add these details, or we could hope that Royal Mail will produce a map telling people where these boxes are located, the photo’s they upload to twitter don’t usually reveal the location (except for Liverpool Cathedral, which you could make a reasoned guess). RM could also include Post Boxes with other plaques attached, such as the Darwin one in Kent & The Trollope one in Fleet Street. I asked Royal Mail on the day this was first announced for a list of the reference numbers for all of the boxes that would have a plaque applied, so that we would know the precise locations. I'm still waiting ... ! I have been in the centre of Birmingham today and visited Chamberlain Square, alleged site of the postbox with Birmingham's special plaque attached to it. I spent a few minutes searching the square for the post box and I am convinced that there is no postbox at all in the Square, I also looked around Victoria Square which is next door to Chamberlain Square without any success (there are 2 postboxes built into the wall of the post office there but no plaque attached to them). So the mention of Birmingham in the list is a mystery to me. I will be in Stratford-upon-Avon tomorrow so I will try to track down the Shakespeare postbox. It’s nice that they are plugging them on twitter, it would be even nicer if they gave more details of the locations. Judging by the ones they publicised already, there being done piecemeal. "Judging by the ones they publicised already, there being done piecemeal." By the look of things in Birmingham, the guy with the screwdriver also needs to install a postbox as well. Perhaps he's got a sonic screwdriver. Went to Abbotsbury yesterday; the village apparently only has two wall boxes. There is no plaque yet and very little room to put one. The PO there (which doesn't have a postbox) knew nothing about it but was grateful for the information. Not sure this Royal Mail Tweet (17/06/15) is completely accurate, but it gives the location as Tudor Square in Blackpool as the location. It's actually Talbot Square, part of which has a view of the tower. See https://goo.gl/maps/0HRAq and rotate and move bit further away and you can see the tower. Thought it was a bit odd, as the SVR doesn't go to Worcester! Runs from Kidderminster to Bridgnorth ! Thanks to everybody for their continued monitoring of this saga, and the corrections! I feel sorry for the postboxes! Wouldn't it have been better to have posters up in post offices (even in the window), than for postboxes to be drilled, .... ? It's probably a pre-cursor to fitting similar sized advertising panels to all postboxes, to maximise revenues! That tweet has been deleted and retweeted today as https://twitter.com/royalmailnews/status/613980447891156992. Only 50 plaques? quite a limited edition for the Royal Mail, how long before they start disappearing and turning up in collections! better still cart off the whole box! Stranger things have ended up in the back gardens of collectors. This month’s ‘Stamp Magazine’ has a feature on Page 22, they list Wrexham & Plymouth in addition to those listed above. This months ‘Stamp & Coin Mart’ also features them on page 8, though it doesn’t list any sites. Slowly but surely the remaining plaques are being publicised.